In these times of high gas prices, this young woman found a way to beat those costs by using Washington, DC’s Metro System. By using her bike to get back and forth to the Metro, she gets some exercise and doesn’t add pollutants to the atmosphere. This station is located in the Foggy Bottom District. If you have read the book by Joe McNally called The Moment It Clicks (if you haven’t, you should), you’ll appreciate the story behind this photograph. I wanted to get a speed shot of one of the Metro trains entering a station using a slow shutter speed to show movement. I found a pole to lean against, took some test shots to make sure I had a good exposure and proper white balance set and put my trust in the Nikon 18-200mm VR Zoom lens as I didn’t have a tripod with me. A minute before a train arrives, the round red lights on the platform’s edge begin to blink slowly (you can see them reflecting off the train’s hull in the photo). Just as they began to blink, this woman with her bike walked into my camera’s field of view and stood still. I had to revise my time to shoot slightly to get the front of the train emerging to her left. I couldn’t believe my luck as I think she made a good photo into an excellent one. 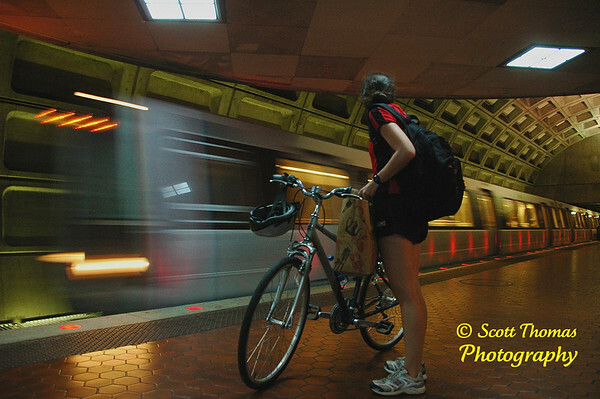 This entry was posted in People, Travel, Weekly View and tagged "washington, bike, Photography, subway, Travel. Bookmark the permalink. Thanks for the tip about the book – I have so much to learn! Thanks, Julie! It truly was one of those situations you couldn’t even stage. I never would have thought of using a person with a bike in a subway. Thanks, Chalkhills Collective! You should check your WordPress settings so your blog link is inserted when you leave comments. You’ll love the book if you get it. It’s not a “How to” but more of a “how does” a pro photographer work and think. It’s excellent. I have a link to Joe’s blog on my More Links page. You can see a link to that page on the right hand side of this page. Wow, what a photo! Congratulation! This is the work of a professional! In Denmark, people take their bikes with with the train in great numbers, therefor there are a bicycle rack in most trains, and the cyclist have to buy a tickets for the bike. Not living near a city with a metro, seeing bikers using it was surprising to me but made sense. No racks that I saw in the Washington system yet. Thank you for your comments. I did try to think like a pro when I planned the shot. Great shot Scott, I never knew that could be done with our camera. Now I have to try something similar. I could have done it last night as we were doing a beach bonfire for supper. I should have read your blog first. A couple months ago I took the Subway from Jersey to Manhattan and they were doing the same thing with the bikes at no extra charge. I love it. When I was young I used to take the bus between Ottawa and Montreal brnging my bike at no extra charge. Great way to move around and between cities. Yep, Bob, the 18-200VR allowed me to get lots of low light photos of the Washington Metro. This was taken at 1/15s, f/3.5, ISO 1400 and 18mm focal length. Excellent shot, and so serendipitous! Impressive that you were able to make those quick adjustments so you could get the unplanned shot off in time. That was such a tight window of opportunity, and you nailed it. You know what else blows me away? That you even know what a train’s hull is. ‘Cause I would just be calling it the side, or that metal thing in the bottom. Thanks, IvoryHut. I was thrilled it came out so good.